With this site, I would like to share with you an experience that has changed my life. It is called Self-Realization, and it has been known in most religions as the ultimate goal in life. 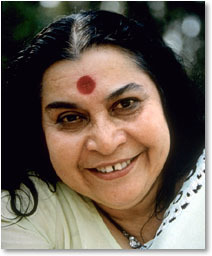 This experience, which was traditionally only reachable by great souls after lives of penances is now possible en-masse through the spiritual powers of Shri Mataji Nirmala Devi, founder of Sahaja Yoga. Wherever you are in the world, you can now try it. If you don't have a Sahaja Yoga center nearby, you can even try it online! I am writing here some of my motivations for practicing this meditation. I hope it will encourage you to try it for yourself. In the early eighties, I had been to Thailand and China and come back to Europe fascinated by the seeming serenity of even the poorest people I had met there. I naturally attributed such tranquility, that I envied them, to the religion they practiced, and on returning home, I set about reading everything on the subject of Buddhism that I could lay my hands on. In 1985, when a friend asked me to accompany him to Kashmir & Ladakh, where he was going to make a documentary film on the Hindu, Muslim and Buddhist communities, I jumped at the chance, especially as I was also asked to do some research into the different religious beliefs with a view to writing the script for the film. As part of that research, I decided to make an appointment with the Dalai Lama when he was visiting Switzerland, and obtained one for June, before leaving for Kashmir. However, to my great disappointment, I was obliged to cancel this appointment at the last minute for professional reasons, and left for India vowing to meet the Dalai Lama when he came to visit the monasteries in Leh ( Ladakh ) on the Indian Independence Day. Apparently, he was in the habit of granting audience to anyone who wished to meet him at that time. So there I was in Leh as planned...... only to learn that for once there would be no audiences given ! Imagine my frustration at the time ! Several months later, back in Europe, I was acting in a play that had been chosen to represent Switzerland in an International Amateur Theatre Festival in The Hague, Holland. On my way to the Conference Centre for rehearsals, I was excited to see that the Dalai Lama would be speaking at a public programme across the hall from where the festival was taking place and meeting anyone who wished to speak to him afterwards. At last, I thought, I will get to meet him ! Third time lucky, as they say ! But believe it or not, when I looked more closely at the poster, I realized that the programme was being held at exactly the time when I would be on stage....! Foiled again...! I just couldn't believe how unlucky I was ! Then a few weeks later I was told about Sahaja Yoga. After getting Realization, I just felt deep down that this was "it". This was what I had been looking for all along. The more I found out about myself through practicing Sahaja Yoga, the more beautiful life became and the greater my serenity, even in times of trouble. Indeed, just after I got my Realization, my mother discovered she was suffering from cancer. Despite ray treatment and chemotherapy, she was going downhill rapidly, and there seemed little anyone could do to help her. One day, when we were speaking on the phone (with great difficulty, as her vocal chords were affected, and she had been told by specialists that she would never be able to talk normally again) she expressed astonishment at the calm she felt in my voice, and wanted to know how I had found such inner peace. This miracle happened 15 years ago, and she is still going strong today....! This is just one of the blessings that have been showered upon me in the 15 years that I have been practicing Sahaja Yoga. Needless to say, after such an experience of the benefits of Sahaja Yoga, I am deeply grateful to Shri Mataji Nirmala Devi for enabling me to get my Realization. Moreover, I am now convinced that the " bad" luck that prevented me following other paths and caused me so much frustration at the time was nothing but a blessing in disguise, part of a divine plan that has been guiding and protecting me all along. My advice to anyone who wants to experience true happiness is.....What are you waiting for...? GET YOUR REALIZATION NOW ! I have tried to give here some of the many reasons why I feel Sahaja Yoga is so precious. When I go into meditation, I discover a treasure of qualities I have never expected in me. Spontaneously, without any specific action from my side, these qualities start awakening and manifesting outside. That's how I start feeling joyous, peaceful, satisfied, secured and more. All human weaknesses and pettiness also start melting away and you are surprised to become such a beautiful person. This experience is a real, live thing. Not something you may read on books or be promised after your death. Also it is a direct relationship between your subtle being and the Divine. You make yourself available by sitting for meditation, and the connection gets established, leading you to the bliss of the thoughtless awareness. Sahaja Yogis recognize and respect the essence of all religions. Shri Mataji says that all Incarnations and prophets are the fruits of a same tree, but human beings have plucked them and tried to keep them for themselves by creating separate religions. Sahaja Yoga unites people of all races, nationalities, religions and cultures. All realize that the spirit is beyond any such limitations. Sahaja Yoga can be experienced in the midst of our worldly life, without any need to hide in a remote place. When you go into meditation, you become more loving and more dynamic. As a result, your social and professional skills improve and you become an integrated member of your community.